The featured race on Saturday’s Starts & Stripes Festival card at Belmont Park, the 2018 Belmont Derby, features a rematch between Analyze It and Catholic Boy; a Royal Ascot winner in Hunting Horn; and a heavily bet Kentucky Derby runner in My Boy Jack. We tasked Horse Racing Nation contributors with handicapping the Grade 1, $1.2 million test going 1 1/4 miles on turf. Here’s what they came up with ahead of post time set for 6:50 p.m. ET. Analysis: Analyze It is almost perfect in his career. If not for a move made too soon last out in the Pennine Ridge, he would be undefeated. Analyze It has been training forwardly off that race and should get a more ideal pace scenario. Connections have a game plan to settle and make a sustained move. This time, I think he will hold on. Hawkish has done little wrong, including winning the Penn Mile, but 10 furlongs remains a question. Hunting Horn, fresh off a Royal Ascot victory, ships in for Aidan O’Brien and retains the services of Ryan Moore. He will be running late. Catholic Boy is back on his preferred surface and beat Analyze It last out. He will need a good pace and will be in the clear on the outside. I’ll go with a 3-8-4-7 superfecta box. Analysis: Hunting Horn scored impressively in a Group 3 at Royal Ascot last out and prior to that, the O’Brien runner was sixth, beaten less than three lengths, in a Group 1 in France. That gives him a slight edge. Hawkish is a Grade 2 winner that can really turn it on late and should be well positioned behind the early speed. Analyze It is a neck away from being perfect after being was out-fought last race following a rapid early pace. He is a multiple Grade 3 winner with ample reserves of late speed. Maraud is 4-for-8 on the lawn, including a pair of graded stakes wins. Analysis: For this race, I’m going with the two Euro shippers on top, Hunting Horn and Kingstar. Channel Cat is a live longshot whose conditioner, Todd Pletcher, trained sire English Channel to a turf championship. The pace may setup to his liking. Analysis: I have full confidence that Hawkish will take kindly to the extra quarter mile distance, and will pin his name among the elites of the turf in 2018. Hawkish is the best horse in this field, and a multi-length victory is not out of the question for Jimmy Toner’s precocious colt that should have sold many of us on his tenacity and rallying energy after that bumpy start in the Penn Mile. Catholic Boy will prove superior over Analyze It once more, coming up short to Hawkish, but clipping a strong close by Hunting Horn, who will finally give O’Brien a happy memory in a graded race at Belmont. Analysis: I think Analyze It comes back and gets the win over Catholic Boy. However, it’ll again be a test, as I believe Catholic Boy is best on the turf. My Boy Jack is a horse who I cannot tell whether he’s wanting the surface change. This race will provide us more insight. Analysis: Catholic Boy is the most likely American in this race to handle the distance. In contrast, Analyze It’s pedigree is shaky at best for 10 furlongs, as his bottom side is very sprint-oriented (look up Sweet Assay and A.P. Assay). If Analyze It fades, he could be knocked out of the trifecta by other proven long-distance runners, such as Hunting Horn and Kingstar from Europe. 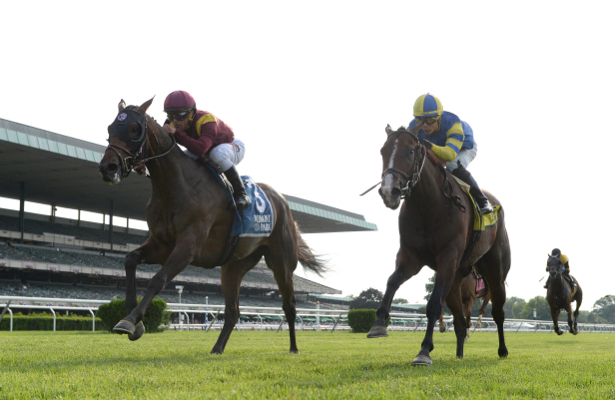 Analysis: Catholic Boy and Analyze It look like consistent, top 3-year-old turf contenders this year and the Belmont Derby provides a fun rematch after their exciting one-two finish in the Pennine Ridge Stakes. If Hunting Horn runs well off his overseas travels, this Royal Ascot winner could shake things up, and he already has a win over the 1 1/4-mile distance.